If he trusts you, you're in. You'll be playing a dangerous game, and he makes all the rules. The only way to win is to do the unexpected. Tunde: Fourteen-year-old engineering genius. Racing against time to save his Nigerian village from a ruthless warlord. Painted Wolf: Mysterious sixteen-year-old activist blogger and strategist from China. Determined to rescue her father from corrupt plans of India's youngest CEO and visionary. Rex: Sixteen-year-old Mexican-American programmer and hacker. Falsely accused of stealing billions of government secrets. The con: Trick a vicious warlord. Infiltrate a mastermind's organization. Protect their families. Save the world. 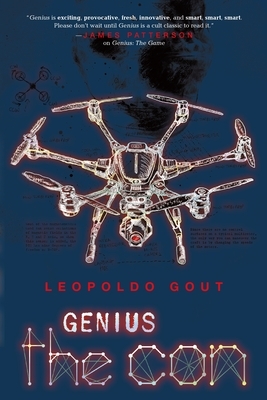 LEOPOLDO GOUT , author of Genius, is a writer, artist, and filmmaker who hails from Mexico. After studying in London Gout produced the Award-Winning film Days of Grace, which A. O. Scott of the New York Times called “potent and vigorous.” He is the Executive Producer of the number one new show of the summer, sci-fi drama "Zoo" on CBS; and is partnered with James Patterson Entertainment to produce "Maximum Ride". Leopoldo Gout resides in New York City with his wife and two children.